It's really hard for people to "get" Oklahoma. I grew up here. My family is here. Church family has become such a vital role in our lives. They have become an extension of our own family. I love experiencing and anticipating all four seasons. We, Oklahomans, say, "If you don't like the weather, just wait a minute and it will change." Spring is pretty dramatic in these parts. Late ice storms to scary tornados... Oklahomans consider themselves amateur meteorologists. We watch weather, talk weather, and dream weather. Summer is usually pretty excruciating here so many Oklahomans head to "the lake." Did you see my article about a cool, new community at Lake Eufaula? Go here to read up on it! Fall is beautiful but undependable in these parts. Sometimes, it will be an Indian Summer until November and sometimes the temperature will drop early and the wind starts sweeping down the plain. Brrrrr. Winter is pretty tricky here in Oklahoma. We usually get at least one snow or ice storm per winter. The weather is chilly and the wind makes it worse. This isn't my favorite season, but it doesn't last too long. The upside of winter is wearing my Uggs all day every day. When stumbling upon our home (literally stumbled... I actually knocked on the door and asked them to call me if they ever decided to sell), it wasn't just the house that we fell in love with, it was also the neighborhood pond adjacent to the lot. My husband and boys love to fish. Our family became the "caretakers" of the pond. This thrilled my husband! When the pond was drained and dredged, a neighbor relocated all of the humongous carp to another pond. My husband contacted a local fish hatchery and ordered hundreds of baby catfish, perch, and bass, all fun fish to catch. We didn't mind the porch the way it was built. On our wish list, we dreamed of expanding it so that we could sit outside and enjoy the seasons, but not be exposed to the elements that each season brings. The original roof line extended about 5 feet, maybe 6 if you include the overhang and gutter. To read more on the remodel of the back porch, go here. The porch was completed only about 10 weeks ago and we have used it EVERY day since. Last week, we watched a rainstorm blow through. The lightening put on quite a show and we stayed dry (except for the boys who had been playing in the woods when the rain blew in). When my sweet new friend, Lindsay of The White Buffalo Styling Company, asked me to participate in a Favorite Room Home Tour, I was so honored to be included among so many talented bloggers, especially since I only started blogging a few months ago. This is my first Blogger Styling Home Tour, but I am planning on participating in the fall and Christmas tours! If you are visiting from Retro Ranch Reno, welcome! I have been a huge fan of Gabbi, first discovering her on Instagram. If you follow me on Instagram, you know what I have been working on this past year. IG is my quick go-to for updates on my favorite blogs. For this tour, I immediately thought of my porch as my favorite room. I know, I know... I say my butler's pantry and my kitchen are my current favorite rooms, but those rooms have me working in them ALL. THE. TIME. Here, on the back porch, I don't have to work. I can bring my coffee and my Bible here in the morning for some quiet time and my wine and my Honey here in the evening for some snuggle time. We love to have family devotions, dinner, and good conversation here. Since school is in session and fall is right around the corner, I was inspired to get the porch ready for cooler temps and more snuggling. Blankets and cushy pillows encourage the family to sit and cuddle. We enjoy watching the boys playing from our cozy spots on the sofa or wingbacks. The coffee table is a thrifted find. I know lacquered bamboo is all the rage, but I really like the natural look out here and the mixing of all of the different elements keeps it warm and inviting. A little drink station is perfect for parties! This antique mahogany butler's tray is one of three that I own. I can't get enough! They remind me of Downton Abbey. So English! ...turn and face the chiminea. Little story on the little old chiminea- We had big plans for a large fireplace on the southwest corner of the porch. The night before construction, we had a cold north wind hit us as we were standing in the fireplace spot. We realized that ashes would be blown out of the fireplace and make a huge mess. We couldn't put the fireplace on the north side of the porch either because that would block the view of the pond. Fireplace couldn't go in the middle of the porch either because that would totally mess with my future plans... keep reading ;) So, we nixed the fireplace for now. Here is the view from my cozy spot on the sofa toward the west. The sun sets a little to the left of this and the light dapples through the trees. I think it is so magical and romantic. We suspended this chippy, iron candle chandelier over the table with chain link. I can totally imagine my boys getting married in this backyard some day. The wrought iron patio set was my on my front porch growing up. I have so many memories sitting on that porch, eating lunch with my mom during Kindergarten. My sister sold the set to my neighbor at a garage sale years ago. The seats were rotted out and I didn't have the time or foresight to hang on to it. When my sweet neighbor moved to Houston this spring, she offered to sell the set back to me. I was so thrilled to have it back in my possession! It had been sitting outside in her yard, exposed to the elements for many years. A ton of elbow grease, paint, and a trip to Lowe's lumber department to repair the seats and I was back in business! We have hosted many our friends here for parties. It is so pleasant under the tree canopy. I am all about using my good stuff and enjoying it. It does me no good in a china cabinet. Blue and white ginger jars gathered from the house make a quick & pretty centerpiece when flowers aren't at the ready. I purposely did not space the beams out evenly, because of my dream for a wedding out here someday. The guests could sit up here with an unobstructed view of the bride and groom under the chandelier, or the wedding party could stand under the porch and the guests could sit in chairs on the grass. :) Planning ahead, I tell ya! 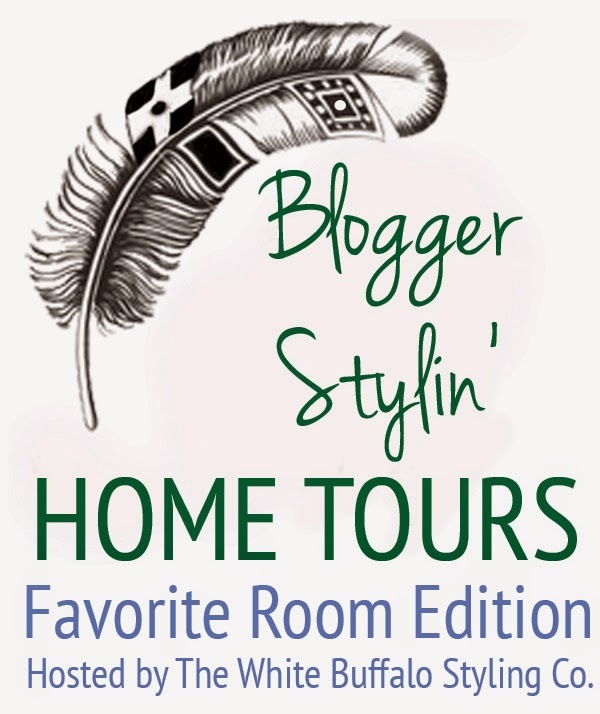 Thank you for visiting this Blogger Stylin' Home Tour, Favorite Room Edition! I am last on the list for today. If you missed any, you MUST go back and look through all of the rooms. All of these bloggers are so talented! One last look at my favorite room!! For a Full Source list of all products, go here!! I love sharing my resources with my readers. Occasionally, affiliate links are used in my posts. Love, love, love this outdoor room and your view of that pond. This is the one space that we don't have. Just an old ugly deck that is too hot to use and needs some major updating. I sure hope you get to have that wedding out there. What a lovely space to start and end your day, weather permitting. i am in LOVE. in LOOOOOOOVE. wow- your porch and yard and exterior are all just gorgeous!!!!! When I grow up I want to be Emily from 11 Gables! This is absolutely beautiful, friend! And is it weird I actually want to move to Oklahoma now!??! I love this outdoor room! Would you mind sharing what color green you used on your doors? I don't DIY, but I may be coaxed to try it on my French doors. I love this post, Emily! You are so right on about living in Oklahoma. You just have to be an Okie to understand our fierce love for the state! OK, DYING over that awesome table(s?) you found for the coffee table! Such a perfect fit! Love, love, love your little slice of heaven on earth. I had SUCH an itch to move after visiting you! Your porch and yard is perfect...and it's hilarious that you're already marrying off your boys in the back yard! It's all so beautiful! Would you mind sharing the source for the fabulous rug? Thanks! Emily~ everything is just beautiful! I love the coffee table, chandelier, rug, etc. It is such a wonderful space for your family & friends. The lake view is just lovely, as well. Having your sons get married in your pretty back yard would be just perfect one day! I saw your post this morning & enjoyed the inspiration for the day :) Great job!! Oh the porch is gorgeous. I would just totally live out there and the view is stunning. Love, love, love the rug too. What a gorgeous porch and yard! I love the knit pillows- just so welcoming! Oh you porch is beautiful and I love that you can enjoy that pretty pond! Emily, I am in love with all your spaces that you have shared here on your blog, but I think this is my favorite. So beautiful, cozy, amazing view, and like you said, a place to relax and not work!!!!! You are so cute with the thinking ahead, I hope one of your future daughter in laws takes you up on the offer to have a wedding there, what a beautiful spot! Just so stunning. Love your place. I too love Oklahoma. I lived in Tulsa for 10 years then moved to Quincy, IL since hubby is from here. All they say about Oklahoma is the same here. "just wait and the weather will change", so I found out it's not all Oklahoma. The two things I was happy to leave behind, the long hot days of no rain in the summer and the ice storms in the winter. We still visit every year since my sister has a winery in the uppermost north central part of Oklahoma called Shidler. So, so beautiful!! What a wonderful place to relax and unwind. I love the memories you have of sitting at the patio set in Kindergarten and that chandelier above it is perfect!! Eleven Gables looks like a wonderful place! I lived in OKC and Edmond for 31 years so I totally get the weather thing. Funny though, everywhere I've lived people say that same phrase - if you don't like the weather wait 15 minutes.... - and I just laugh, because I know that only in OK is it really true! We were visiting during the Christmas Eve blizzard in 2012 and it makes me laugh to think how we shoveled snow the next day in our flip flops. I've perused through your blog trying to figure out what city you are near. Holy cow! You look like you live on a golf course or resort! wow! Holy cow, Emily - your porch is so gorgeous! And that view - I am so jealous. My girls would love the fishing too :) I grew up fishing for perch and sunnies and bass - so fun. Your outdoor space is gorgeous!!! I love everything that you did with your patio - I'd be hanging out there all summer long! Emily, your setting is just idyllic! I love everything you've done and your plans for the future! :) So happy you got your childhood set back! what a wonderful spot! i love that coffeetable and rug. Breathtaking, Beautiful, Bountiful are words that come to mind when I see this space! You've done it again with grace, style and elegance. I love how you effortlessly pull together styles and create such an inviting space! What a sanctuary for your family to enjoy God's beautiful creation with one another! Of course, I love the blue and white pieces that just tie everything together! I'm in awe and can't wait to enjoy a little time on this porch! Thank you for the very sweet shout out for my bday. Wow! I feel so very honored!!! God has give you such a gift for decorating but also for bringing people together! You've always had a way of making the everyday so extraordinary!!! I love to see your gift painted all across these pictures! Let's have a birthday tea on your porch in September! Your covered porch and entire backyard are simply lovely. Love your details, love your story -- especially the table and chairs from your childhood! And by the way, I'm going to be tucking some sprigs of rosemary into napkin rings sometime soon! What a lovely porch and yard. I would spend most of my time just relaxing and taking in the view if I live there. What a wonderful and calm setting...and the view is beautiful...I don't think I would want to leave! New to OK from TX, and it is so different here than in TX..this last winter almost pushed me over the edge ;) but we are really loving our time here! Your home is beautiful! You have done such a fabulous job! amazing! enjoy your space you did a great job! I love every detail Emily! So beautiful! I would spend every day out there too!